In the last century the Fellowship of St Alban and St Sergius gave to Russian Orthodoxy an opportunity to speak with a voice never head as powerfully before in the western world, in a sustained encounter with the Christian West, and from the date of its foundation in 1928 the Journal of the Fellowship of St Alban and St Sergius, later Sobornost, sought to strike a good balance between Western and Eastern contributions to Christian thought. It provided an ecumenical encounter principally between the exiled Orthodox intelligentsia of the Russian diaspora and the Catholic party of the Church of England, but also on occasion with Presbyterians, Methodists and other Protestants. increasingly on the East’s terms—and, in another striking development, this meant the Greek East rather than the Russian. This process of transformation was only gradual, but by the start of the twenty-first century, Sobornost was fast becoming, especially through its mediation of modern Greek philosophy, theology and spirituality, as well as the more traditional discipline of Byzantine studies, a largely monophonic voice for Orthodoxy in the West. This was a far cry from its origins, even if that voice was also much needed in an often disoriented English, European and North American Christianity. 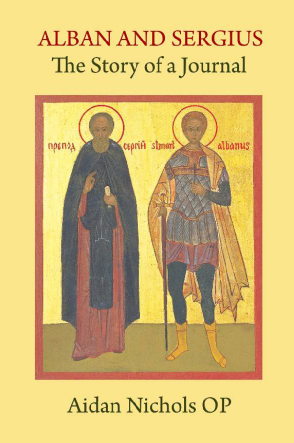 Throughout its history, what has been invaluable for Western readers is provision of information about the Eastern Churches, and especially the Byzantine or Chalcedonian Orthodox - always the more important part of both Fellowship and journal. A definitive role for the present and the future, as the both celebrate their 90th anniversary. Aidan Nichols, a Dominican of Blackfriars, Cambridge, is surely the most prolific Catholic theologian writing in English today. Other titles from Gracewing include Catholic Thought Since the Enlightenment; Lessons from a Rose-Garden: Reviving the Doctrinal Rosary; Year of the Lord’s Favour a four volume Homiliary for the Roman Liturgy; and two studies on Orthodox theologians, Mystical Theologian: The Work of Vladimir Lossky and Wisdom from Above: A Primer in the Theology of Father Sergeĭ Bulgakov.